Luke Slade stands under a spotlight in an AC/DC shirt while he offers up a soliloquy about life and death. This is the beginning of Artifice. Artifice, this year’s production by the Oakham Community Theatre (OCT), was a lineup of four different plays written, directed and performed by volunteers in the Ryerson community. 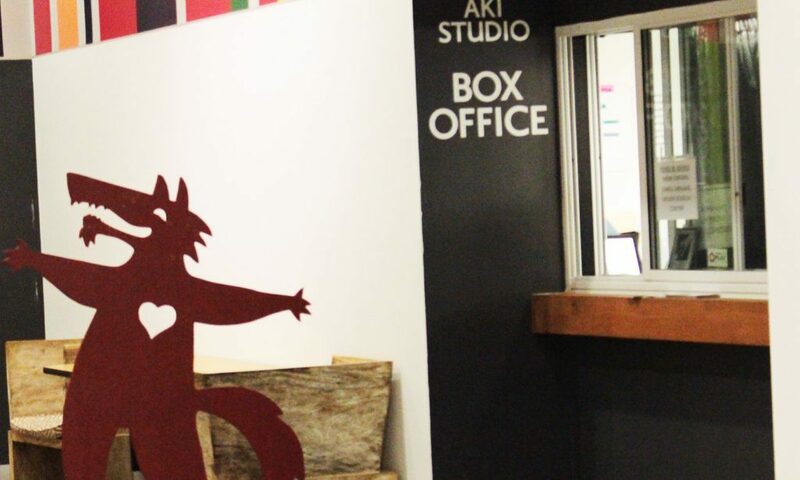 Performances were held at Aki Studio in the Native Earth Performing Arts building. It ran from March 14 to 17, with shows taking place from 7:30 to 10:30 each night and a special 2:00 matinee on Saturday. In October, writers anonymously submitted plays they had written for adjudication. Once the board voted, writers were notified if their play had been selected and then chose between directing their own work or handing over duties to someone else. Open auditions began in November, and the OCT welcomed anyone with any level of acting experience. Cast and crew then rehearsed the four plays and after five months of work, it all came together. This production was reminiscent of early plays because it followed the three classical unities of drama—such as the majority of the action taking place in one setting, having only two characters, and powerful dialogue revolving around one issue. Prodigal examined themes of family, change and loss. It told the tale of an estranged brother and sister who get stuck on the roof of their old apartment and have to confront their pasts—and the pain they have caused each other. The play was directed by Stacey Foh, a recent graduate of Ryerson’s environment and urban sustainability program. Foh wrote in an e-mail about how the work’s themes are central to the story. Foh also explained what her thoughts on the advantages and drawbacks of community theatre. Deface was a piece that may have seemed familiar, because it appears to draw from narratives like V for Vendetta and the 1964 Twilight Zone episode, “Number 12 Looks Just Like You.” In a dystopian world where people can buy a face and hide who they are with it, one mysterious figure fights for their own identity and the value of non-conformity. It was written by a former OCT artistic director, Bryan Chu, who opted to have Mieka Shade, fourth-year creative industries student at Ryerson and general manager of the OCT, direct his work. Deface is reliant on dialogue, which tends to weigh it down at the end. Shade explained that even if a work is exciting because it has fight scenes and twists, clarity still needs to be a director’s first priority. “Although the story needs to be cool, you really need the audience to understand the story. I can put really cool things on stage, but if nobody understands it, then what’s the point?” she said. Though she admitted that directing a play can be a lot of work, she values the opportunity community theatre gives writers and actors to be a part of something they might not otherwise be able to participate in. Bronwen Spolsky, a second-year sociology student, wrote a play that explores the boundary between imagination and reality. It is unclear how much of the action in Letters to Myself actually happens, and how much is imagined by protagonist Richard Silver. The play provided an interesting look at relationships and how people might never be who you think they are. Spolsky, whose work was previously featured in last year’s production, explained that Letters to Myself was inspired by some of the people in her own life, and as a writer, the challenge is to never create caricatures. It is an emotionally-contained story with a powerful climax and a minimalistic vibe that works perfectly for community theatre. Spolsky believes community theatre is an important institution because it can be a place for pure art, where the story is the highest priority. The night ended on a much lighter note with a comedic retelling of the story of Pinocchio, the wooden puppet who wanted to become a real boy. According to the introduction of the play, Storia Pinocchio is re-enacted in the style of Italian buskers from centuries ago. It makes heavy use of fourth-wall breaking, as well as audience interaction. It was written and directed by fourth-year Ryerson child and youth care student, Janine Fernandes, who is also the artistic director of OCT. Fernandes explained that while she was in Italy, she became inspired by a performance she saw that was told in an old style of Italian theatre. She thought the archetypal characters and audience interaction would make a great addition to OCT.
“I think it’s a really long process that requires a lot of commitment and dedication…. The process of bringing your own work to life is really great because you already have a vision for it in your head. But, in some ways, that’s also harder because you’re not always able to make it exactly as you pictured it. But I think there’s something really beautiful about what you manage to make instead,” she said. All of the productions show the power of the theatre and how it can mean enough to people that they will all volunteer to bring these scripts to the stage. When Storria Pinocchio ended, the cast of all four productions came out together to bow. The small theatre seemed to be filled with the jubilation that comes from celebrating something special with others who share a love for it. “Community theatre is really wonderful in the way that it involves anyone who is passionate about theatre…it shows the amount of passion there is because you are doing just purely for the joy of theatre. And there really isn’t anything else you’re getting out of it other than getting to create something on stage,” Fernandes said. Artifice, as a combination of these four very different plays, is described as a production that examines truth and the human condition. There are truths, lies, secrets, action, pain and love. What stood out at the end of the night might still be the lone actor under the single spotlight, and the realization that there are so many other dedicated and passionate people around him, who make the show happen. Ryan Tuchow was a Winter 2018 Masthead student and Managing Editor of Social Media and Engagement for the Ryersonian. He graduated from Ryerson with a Bachelors Degree in Journalism, a Certificate in English Literature and Pop Culture from Ryerson University’s Chang School. And a Double Minor in English and Politics.